Produce an avian-themed iPhone game, and you can expect people to let fly with the Angry Birds comparisons. That would be unfair to Air Penguin, a $1 game for the iPhone and iPod touch from Gamevil. Yes, the game features birds—penguins, to be precise—and they do seem a little bit miffed about the polar ice caps melting (Perturbed Penguins?). But this is an entirely different kind of casual offering for the iPhone, a scrolling platform game instead of a physics-based puzzler. Air Penguin also goes for a completely different control scheme. Instead of on-screen buttons or touch controls, Air Penguin relies entirely on the iPhone’s built-in accelerometer to control the action. It’s this feature that will either delight iPhone gamers or have them angrily pressing down on the Air Penguin logo so that they can remove the game from their devices. 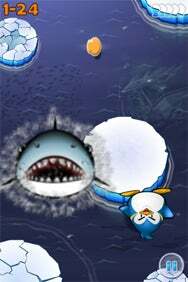 I Was Not Aware There Would Be Sharks: it’s hard enough to get your Air Penguin from one ice floe to the next. You also have to contend with obstacles like penguin-eating sharks. Air Penguin offers two modes of gameplay, with the Story mode front and center. Melting ice caps have separated the titular penguin from his family, and it’s up to you to navigate him from ice floe to ice floe across a series of stages. That’s where the tilt controls come into play. The Air Penguin is a body in constant motion, bouncing up and down. You tilt your iPhone forward, backward, and side-to-side to make sure he lands safely. Flick your phone with the enough vigor, and you can make the penguin swerve around obstacles and back to safety. And that’s crucial because Air Penguin throws plenty of obstacles in your path. Sharks will occasionally leap out of the water to gobble you. Swordfish will fly through the air to spear you. Walruses will bang into you as you slide down a sheet of ice like out-of-control NASCAR drivers. Note that you can temporarily disable some of these obstacles by using some of the fish you collect along the way. (You can also buy extra fish via in-app purchases, but that strikes me as decidedly unsporting. Also, I am cheap.) Marine biologists might cringe at the cross-section of wildlife that appears in Air Penguin, but they add a challenging element to what could have been a pretty dull platform game. The tilt controls also offer a challenging element, though I’m not sure how welcome it will be to every iOS gamer. It can be very difficult to land your penguin with precision. Just the slightest variation in how you tilt your iPhone can turn what normally would be a safe jump into a catastrophic plunge into the icy depths. You can fiddle with the controls’ sensitivity in the app’s settings, but it’s a very tiny slider. I also wish Gamevil had included a button to return the controls to their default sensitivity for those times that I was unhappy with the results of my tinkering. I found the game a challenge to control, particularly as more obstacles were added in the later stages of the game. But I’m up for a good challenge, and for me, Air Penguin’s controls never became too frustrating to use. That’s a fine line, though, particularly in a casual game like Air Penguin. I’d encourage people to take the free lite version out for a test spin first to see how they feel about the tilt controls. It puts limits on the number of stages you can complete, but it will give you a good feel for the game before you commit to the paid version. In addition to Story mode, there’s also a Survival mode requiring you to keep your penguin aloft and out of the water for as long as possible. I didn’t find the Survival mode to be as compelling as gameplay in Story mode, but I appreciate that it’s there to keep things fresh. There are a lot of nice, little touches in Air Penguin—you can make out the outlines of shipwrecks in the water below, and occasionally, a school of fish will swim buy. The background is cute, and sound effects—like the chomping noises those sharks make when they try to devour your penguin—are particularly well done. Tempting though it may be to compare and contrast Angry Birds and Air Penguin, I’m going to resist. The former may rule the App Store roost, but the latter is a rara avis in its own right.